The Chevrolet 265 cubic inch, 195 hp V-8 engine and 3-speed manual transmission were finally made available in 1955, although almost all cars were equipped with the venerable Powerglide automatic. The $12 windshield washer option was operated by a foot pedal. 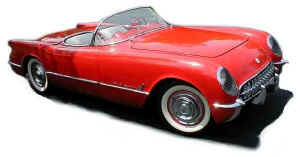 Only 700 Corvettes were produced for 1955. The introduction of the 1955 Ford Thunderbird became serious competition and almost doomed the Corvette to an early demise.